The world’s first truly digital online bond trading solution. We are pleased to offer the world’s first truly online bond trading solution, initially offering 5,000+ investment-grade, high-yield corporate and government bonds globally in 20 currencies. Try it Free . Most “digital” bond trading solutions in the market involve manual intervention in some way, either in that the order is placed from an online platform but is handled manually by a trading desk, or that the order only goes to a trading venue controlled by the broker and not the entire market. With us, the order is streamed directly into the market and out to global liquidity providers, who will compete for the order. Our solution is online from front to back, with no manual intervention. Why Trade Bonds on Global TradeStation? Bonds are a valuable diversification tool for protecting your portfolio against volatility or stagnation in equity markets. Offering an alternative in times of unpredictable or stagnant equity and currency markets, bonds can be an important and conservative capital preservation component of an investment portfolio. Yet, even today, trading bonds is a time-consuming manual process that involves several phone calls and numerous brokers – all without any price guarantee. Until now that is. Global Trading is cutting out the cost-intensive middleman in bond trading, giving you direct access to liquidity providers. 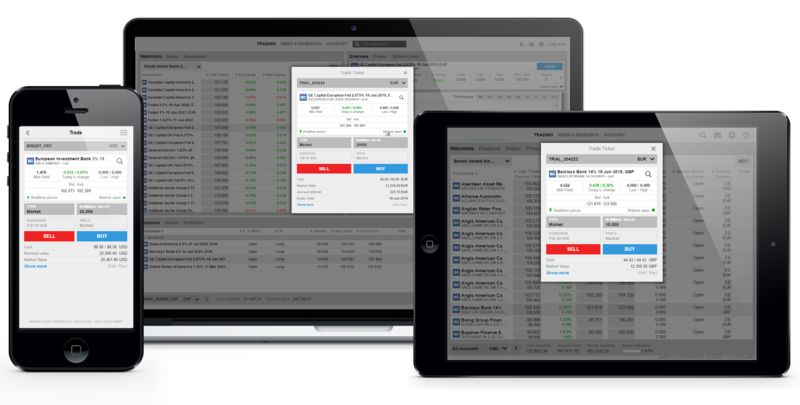 With Global TradeStation, you trade bonds in the same account and using the same platform as any other asset class. You have access to the global market. The technology is intuitive, trading is easy and quick, liquidity is reliable, prices are low and transparent. The tools Saxo places in your hands are fit for the pros. Trade bonds on your smartphone, continue on your tablet, and finish the trading day on your laptop. Direct access to a universe of over 5,000 bonds, including over 3,400 developed market bonds and more than 1,600 emerging market bonds. Trading is available whenever markets are open, and orders are routed directly to an optimised dealer auction, where 40 top-end liquidity providers compete for those orders. In contrast to the industry’s standard “one bank, one price” approach, we provide a competitive commission-based pricing model that offers full transparency. It goes beyond our robust technology – our liquidity, transparent pricing, market access and commitment to long-term client relationships provide lasting reliability. You choose the trade, and our platform provide the access to multiple bond providers, automatically directing your order to the best price available in the marketplace at that moment. Our offering is truly global, covering government and corporate bonds from the US and Europe, plus select high yield and emerging market bonds from LATAM to APAC and in both USD and local currencies. Download our software and trade a demo instantly. Get instant access to the global capital markets. For availability of other bonds and pricing, you can contact Euro Pacific Bank or your private banker. The coupon payments on the bonds will be credited directly to your account in accordance with normal settlement procedures.